My main reason for visiting Nagano was to do a day trip to Jigokudani Monkey Park, home to Japan’s famous hot spring loving, wild snow monkeys. I was inspired to visit Jigokudani Monkey Park by all the adorable photos I was seeing of snow monkeys soaking contentedly in the hot pools. As an animal lover, this quickly became one of my must-do experiences in Japan, especially since I had such an enjoyable time at Iwatayama Monkey Park (in the Arashiyama district of Kyoto) a few years earlier. I visited Jigokudani Monkey Park in mid-March and was slightly worried that maybe the snow monkeys would have gone back up the mountain by then, since the temperatures were warmer and snow had mostly melted. But lucky for me, there were plenty of Japanese macaques in the park and I had a delightfully entertaining morning watching these cuties “monkey” around! With my Snow Monkey Pass in hand, I eagerly awaited the morning’s first bus from Nagano Station to Jigokudani Monkey Park. Thrilled to be the first and only person in line, I congratulated myself for beating the tourist crowds. Eventually a few more people showed up, and soon 8:15 am came and went, with no bus. Hmm, that’s very unusual for a bus to be late in Japan, I thought. The small group of us that were waiting started talking and comparing notes, only to realize we had all misinterpreted the bus schedule. The 8:15 bus only operates on Saturdays, so now we had to wait for the 9:00 am bus. When 9:00 am rolled around there was a much longer line, squashing any regret I had about being at the bus stop so early. Boarding the bus, I made sure to take a seat at the very front, knowing that I could power walk my way to the park and get there before the crowd behind me did. About 45 minutes later, we arrived at the Snow Monkey Park Bus Stop and I excitedly hurried up the road and around the corner to the park entrance. The trail to Jigokudani Monkey Park was forested and muddy in places, but was not a difficult walk. Once I got to the park, I was greeted with more monkeys than I had imagined. They were down by the river, up the hillsides, on the paths, and sitting on the edge of the hot spring pool. But none were bathing in the water. I wanted to see the monkeys relaxing in the steaming onsen, as they were doing in all the photographs I had seen, but I knew they typically only enter the hot spring during the cold winter months. Still, I remained hopeful and planned to wait around for a few hours to see if one would go for a dip. While I waited, I was thoroughly entertained by playful baby monkeys splashing their hands in the water, sipping from the pool, hanging from tree branches, and riding around on their moms’ backs. Even the older monkeys, while far less energetic, were interesting to watch as they groomed each other or nodded off for a short poolside nap. Maybe I’m alone here, but I did not know that monkeys swam. I was so surprised to see them dive down and glide under water, instead of just half-immerse their bodies while they hung onto the ledge. I could have watched them swim and splash each other all day long. They were especially amusing when they got out of the pool dripping wet, then shook their bodies to fling off the water. I had so much fun watching the snow monkeys at Jigokudani Monkey Park and spent about 2 hours admiring their cuteness and laughing at their playful shenanigans. Their facial expressions were priceless- like little furry, silly people! I would definitely come back here again if I did a winter trip to Japan so I can experience a hot spring full of monkeys surrounded by snowy scenery. I’m so thankful I made the trip from Nagano to visit the snow monkeys. Even now, it makes me smile just thinking about how much personality they had. I’m glad I caught the first bus to the park because by mid-day it was crowded around the small “monkey onsen”. Earlier in the morning I could move about and get different photo spots, but once it got busy, I had to stay put and hope the monkeys came to me. I liked that Jigokudani Monkey Park is not a caged animal attraction. The monkeys are wild and can come and go as they please, so you really get to see them in their natural habitat. They didn’t seem even slightly concerned that there were so many humans milling about, but I still let the monkeys decide how close they got to me, just in case. And wow did they ever get close- one brushed up against me as it walked past! Of the two monkey parks in Japan I’ve visited, I’d say that Jigokudani is my favourite, mostly because it was incredibly amusing to watch swimming monkeys! I took so many photos of the Japanese macaques at Jigokudani Monkey Park and had a blast trying to capture their lively personalities and expressions. Here are a few more pictures of monkeys to make you smile! 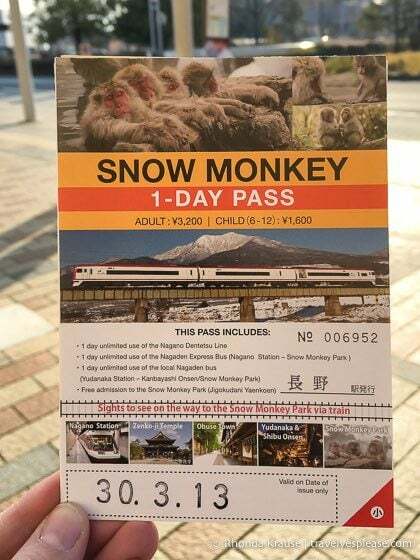 There are two ways you can get to Jigokudani Snow Monkey Park by public transportation from Nagano- take the express bus or a combination of train and local bus. I took the express bus because it was the most straight forward. By Express Bus: The express bus leaves from the east exit of Nagano Station, usually at stop #23 or #24. The bus you need is headed in the direction of Shiga-Kogen via the monkey park. It takes up to 47 minutes to arrive at the Snow Monkey Park Bus Stop. From the Snow Monkey Park Bus Stop, it’s a 30 minute walk by street then forested path to the monkey park. By Train and Local Bus: At Nagano Station, take the Nagano Dentetsu Line (Nagaden) to Yudanaka Station. It takes 44 minutes and you may have to switch trains at Shinshu-Nakano Station. From Yudanaka Station, a local bus will drive 10 minutes to either Kanbayashi Onsen Bus Stop (closest to the park) or Snow Monkey Park Bus Stop. You then need to walk from there. * The train and bus to Jigokudani Monkey Park are NOT covered by the Japan Rail Pass. A map to the Snow Monkey Park and copy of the bus and train timetables. Hours: The monkey park is open 7 days a week from 8:30 am- 5:00 pm (April- October) and 9:00 am- 4:00 pm (November– March). Entrance Fees: There is a fee to enter the monkey park. Children aged 5 and under are free. Best Time to Visit Jigokudani Monkey Park: This is not a zoo, so monkeys can come and go as they please. They generally come to the park every day, but may stay up in the mountain when there is plenty of food available. The best time to see monkeys bathing in the hot spring is January and February, but there is snow in the region from December to March. How Long to Spend at the Monkey Park: Ultimately that’s up to you, but I was happy spending about 2 hours in the park. I got back to Nagano at 1:45 pm, which gave me enough time to visit Zenkoji Temple. Services: There is an information centre and gift shop at the park and some restaurants nearby. You can even rent snow boots, ice cleats, and winter coats. More Information: Visit the Nagano Snow Monkey Resorts website for more information about planning a visit to Jigokudani Monkey Park. For your convenience, here is a list of hotels in Nagano and Yamanouchi. Please consider booking your accommodations through the included link, as it costs nothing extra and helps support this website. Thank you!